Laparoscopic adrenalectomy (LA) has been shown to reduce hospital stay and morbidity when compared to open adrenalectomy (OA). It is uncertain if the laparoscopic resection of large (≥6 cm) potentially malignant adrenal tumours is appropriate due to concern over incomplete resection and local recurrence. The aim of the present study was to compare the outcomes of LA for tumours ≥6 cm with those < 6 cm. 103 patients were referred for adrenal resection. Three with metastatic adrenal carcinoma and two with severe cardiorespiratory disease were deemed unsuitable for operation. One hundred and eleven adrenalectomies were performed: 101 LAs and 10 OAs. Thirty-nine LA were for tumours ≥6 cm while nine OA were for tumours ≥6 cm. There were no significant differences between the median total anaesthetic time, postoperative complications or postoperative stay for patients undergoing LA for tumours ≥6 cm versus tumours <6 cm. Of the six conversions, five were performed for adrenal tumours ≥6 cm [local invasion (n = 3), adhesions (n = 1), primary renal carcinoma (n = 1)]. All tumours in the LA group were resected with clear margins and at a median follow up of 50 months (range 38–74 months). There has been no evidence of local recurrence. In the absence of local invasion, the outcomes of laparoscopic adrenalectomy for patients with tumours ≥6 cm were comparable to those with tumours <6 cm. 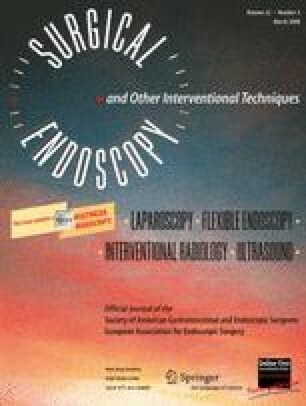 This has helped confirm a policy of initial laparoscopic resection for all noninvasive adrenal tumours can be applied safely.